Considered to be mainly treating various types of gastric disorders but this Vati also finds application in various other disease types too. This Vati brings about the cleansing the entire system thus helping in the attainment of healthy mind, body, and soul. As per the ayurvedic texts, Chitrak is known as fire. Therefore this formulation is best for the improper or the lack of digestive fire. It works on indigestion, lack of appetite, abdominal gas and removes Ama dosha’s which are due to lake of fire. Taste of this tablet is delicious, so it produces salivation and helps to increase the appetite. Increases digestion, and also increases appetite by helping the liver to function better. Its unique combination acts as an appetizer if taken before a meal and as a digestive if taken after the meal. By stimulating fat burn it also helps in mobilizing over deposited fat from the tissues. It Helps in removal of the excess gases or air in the stomach and controls the occurrence of flatulence. It has wonderful action on Irritable bowel syndrome in which constipation followed by diarrhea. By maintaining peristaltic movements of intestine it improves the symptoms. It can also give in conditions of painful urination. It is useful in obesity also as it improves metabolic rate of the body. Effect on Tridosha: Balances Vata and Kapha. Improves Pitta. People with high BP should take this medicine only under medical care since this medicine contains salt as an ingredient. 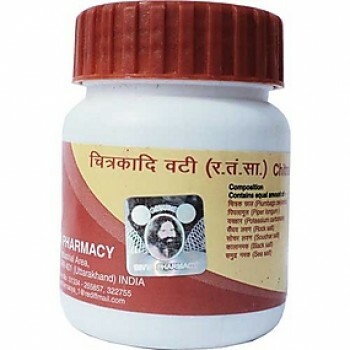 Baidyanath - Arogyavardhini Vati 40 Tablets Promotes digestive fire (Pitta), clears body channe..
Alarsin - Sooktyn 100 Tablets A mineral-herbal drug which is being used for the treatment of..
Ayurveda Rasashala - Amex 60 Tablets Improves gastrointestinal secretions and motility, for ind..
Dabur - Lavan Bhaskar Churna Powder 60 g A carminative and gastric stimulant. Made of a mixture..